Comedy films, especially modern comedy films, face the eternal dilemma; how to stretch an exciting premise and/or characters into a feature length film? Harder still; if the original throw of the dice works, how do you then extend it out for a second outing? Was the original success down to a serendipitous meeting of time, script and cast? In the case of the outlandish news team of Burgundy et al, there is plenty of audience goodwill hoping for this sequel to chime the bells of success. The story covers Ron as he heads out on the road to round up his old team. An offer has come in to be part of a new concept – the 24-hour news channel. After initially scoffing at the idea (get the vague hint of satire here? ), he is soon won round. He is all primed, prepped and ready for his 2am slot. It doesn’t help that he quickly gets embroiled in a rivalry with a colleague; primetime slot golden boy, Jack Lime (James Marsden). A ratings war soon beckons before a third act involving blindness, a lighthouse and an orphaned shark. Yes, really. If you were not a fan the first time round, you may well be pleasantly surprised. That’s if you can forgive the occasional slips into tasteless comedy (some racist and misogynistic quips sneak in when they really should have been left on the cutting room floor). There are moments of invention and genuine hilarity. If you are already a fan, then it is safe to say you’ll no doubt intend to see this no matter what we or anyone has to say anyway. As the outline indicates, much of the plot, no matter how knowing and self-aware, is a little hackneyed. It certainly would not need the predictive leanings of the Mayans or Nostradamus to anticipate where the narrative will steer come the close. That’s not the joy of this type of feature though. It rests in the jokes that make up the journey. And although uneven, the sheer frequency of the gags ensures that any bum notes are lost amongst the ones that strike gold. Add to that a climactic scene that is truly bonkers – a plethora of famous names and faces crop up in a particularly surreal final battle scene (we won’t ruin the surprise by sharing their names) – and you have something of a satisfying sequel. It is hard to think of any comedy film stretching beyond the 80-90 minute range that is considered a classic. 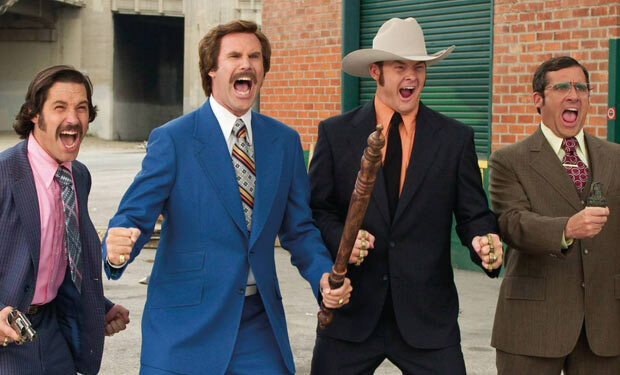 At 2 hours long, Anchorman 2: The Legend Continues doesn’t change that. It is overlong. It does need trimming. With that said, it is equipped with enough spark to please. It will also guarantee plenty of chuckles. This mob has lost none of their peculiarly unique brand of charm, wit and irreverence. It’s good to have them back. This entry was posted on 19/12/2013 by toomuchnoiseblog in Reviews and tagged adam mckay, Anchorman 2, christina applegate, Cinema, comedy, Film, Greg Wetherall, harrison ford, jim carrey, liam neeson, marion cotillard, movie, paul rudd, Release, Review, Steve Carell, The Legend Continues, Will Ferrell, will smith.